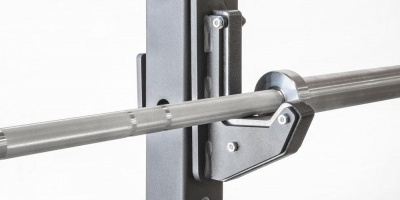 You get a hold of a great power rack or squat rack, but then you find out that the company doesn’t make the attachments / accessories that you want. No problem! You should be able to find a compatible attachment or accessory, as long as your rack is made with one of a few standard configurations. The tubing size of the uprights, typically one of: 2″x2″, 2″x3″, or 3″x3″. All 2″x3″ racks have the 3″ sides oriented the same direction. The hole diameter in the uprights. Attachments need to have the same size pegs, ie: 1″, 5/8″, etc. The hole spacing in the uprights, ie: the distance between holes on center. This is only an issue for larger attachments that use 2 holes, like with a peg and a locking pin. Some racks have Westside spacing, which is 1″ spacing at a certain height range for setting bench press safety bars just right, and otherwise 2″ spacing above and below that. Attachments can also fit in larger holes. For example, Rogue’s Infinity attachments with 0.63″ pegs can fit into the Titan X-3’s 0.69″ holes. When an attachment is made for a larger hole, it will be able to tip forward a little because the rear hole does not secure it. Similarly, attachments can fit onto slightly smaller tubing than what they were designed for. For example, Titan attachments for 2.5″ tubing can fit onto Powertec’s 2.4″ tubing. This can actually be a better situation than the wrong hole size, because you can glue shims (UHMW plastic is best) to the inside of the attachment’s bracket to make it fit perfectly. Some attachments work well enough even if they’re loose. Some don’t have enough pressure put on them to make any difference, like a rope anchor. The steel gauge of racks does not matter. The difference in dimensions is too minuscule to count. I don’t recommend you use certain safety-critical attachments like J-hooks or steel safety arms designed for a slightly larger sized hole or tube. Depending on the fit, they may tip forward or wiggle too much. Weight plate storage attachments can present a similar problem, where the storage peg won’t stay perfectly horizontal if it’s too loose a fit. You could run into poorly welded attachments. If you’re stoked to get those new crazy cheap J-hooks and your heart falls into your stomach as you find it doesn’t fit very snugly, well, it probably fits the same on that manufacturer’s own rack. Attachments as a rule don’t fit perfectly snug, but better brands like Rogue and Rep Fitness have the highest and most consistent quality, in contrast to the gamble you may be taking on Titan Fitness’ quality. These are ordered smallest to largest. For a lat pulldown / low row cable system that works on almost any power rack, see the well-designed Spud Inc Pulley System. Not listed here are complex attachments and accessories that will not fit any other racks. These include any attachments that mount on the top or bottom crossmembers or need the rack to be a very specific width. Examples are special pull up bars and almost any vertical barbell holders. are compatible with this size. I will add the attachments here if another brand shows up. If you’re getting a battle rope anchor, see our article on battle ropes for some buying advice. For more on the strap safeties used as an alternative to traditional steel safety bars, see our article, Are Power Rack Safety Straps Safe? this list if I find another brand that these fit. 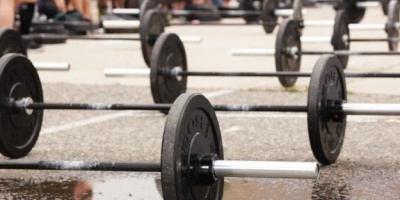 These will also fit the Powertec racks, with 1/8″ slop. holes, which are incompatible with any other racks. In case anyone is wondering, the Titan X-2 weight storage posts do indeed fit the Rogue ML series. Rogue’s 4″ between the center of one hole to another is precise, whereas Titan’s is hair shy of 4″, but it works nonetheless. Obviously, you need longer bolts since the bolts included with these are designed for a 2″ W post. ok so. They are sooooo close. Do you think the 2×3 rogue stuff or even fringe will fit the 2×3 Rep fitness rack? Not likely They’re made to a pretty snug fit. The only ones I expect would be fine are like the Rogue Landmine that uses a bolt (you can pick up a longer bolt if necessary) or something that doesn’t wrap tightly around the 3″ part of the tubing. Will the Rep safety straps 36″ fit my 36″ deep Titan X-3? The Rep straps are made to fit 30″, too short for the Titan X-3. Is there a solution to get s straps for the X-3 / 36″? Looks like Titan hasn’t made straps for their 36″ version yet. You probably have to wait for those. Are these Safety Spotter arms compatible with the 3×3 1″ Rogue Monster racks? Yep, those Valor ones should fit perfectly! They look like they might be really nice spotter arms if the measurements are done just right and the quality control is on par. According to my records they came out with those one year ago. Let me know what your assessment is if you get them! Thanks for putting this information together. I have a Powertec rack, the square tube size measures 2 3/8″ x 2 3/8″. Is this considered a standard 2″ x 2″? I am looking at the Titan T-2 accessories and trying to make sure they will fit before purchasing. Thanks. I’ll correct that. The Powertec tubing is more like 2.5″ x 2.5″ as you say. The attachments for that size are very limited. Also, Powertec is probably metric at 60mm / 2.36″. The American vs metric sizes are a complication that I haven’t addressed yet. But you can generally ignore the small difference and assume any attachment made for 2.5″ x 2.5″ will fit over the outside well. Cool, I’ll get it added, thanks! I have a Sorinex power rack, which I repped from CL. Sorin standard HOLE size is 1 inch and 1/16 to mm, which of these brand accessories can I buy that would be 100% compatible with Sorinex power rack hole dimensions. PS: Sorinex power rack attachments & accessories are out of my budget and I am looking to add from any other brand, (1) Y Dip assist, (2) landmine attachment (3) Safety spotters pair / Saftey arms. So you’re saying the hole size is 1 1/16?” What do you mean about the mm? What is the tubing size? David, Thanks for your prompt reply, Yes – I was meaning to say hole size is 1 1/16 (this as per Reflex fitness who built Sorinex racks in the past). You could use most attachments that are for 1 inch holes and they would just be a little bit loose, which is fine depending on the attachment. The problem here is I don’t know of any other racks with 1 inch holes that use 2 x 3 tubing. Hi David, It was my bad, the uprights are 3″ x 3″ with a hole size 1 1/16″, can you please advice on the attachment compatibility. See the section above for 3×3 tubing and 1″ holes. The holes will be a little large, so it could wiggle or hang forward, depending on what attachment it is. Titan now has a strap safety to fit the T2 racks. Thanks Dave! I will add it to the list. It’s great to see more companies doing the strap safeties. Big improvement over traditional steel safeties, IMO. Maybe they aren’t as easy to trust at first as steel, but they all appear to be made well and I haven’t heard of any failing. I want to update this comment to say that Titan’s straps did have reports of failure in early 2018, including one or two on video. Titan recalled them, but they haven’t yet come out with a stronger replacement. Useful article, thanks. I don’t see the Rep PR-3000 storage posts, land mine and safety spotters listed as compatible with the R3 but would assume they are based on the numbers. The Rep safety spotters will work. I will add that to the list. Thanks! The Rep storage posts needs hole spacing on the outside edge of the uprights that doesn’t match the R-3. The Rep landmine attaches to a gusset plate that the R-3 doesn’t have. The Titan X-2 is 2”x2” with 11/16 holes. One thing that I know that’s compatible is the T-3 multi-grip pull-up bar because I have it. One thing I think that’s compatible is the T-3 landmine attachment because it goes through the 2” side of the bar. Thanks TJ! I have added a section for the X-2 accessories and added your note about the T-3 pull up bar and landmine. The landmine ought to fit just fine! I need to add some more brands of racks to this list. Any suggestions? I actually found this blog because someone referred to it on the subreddit r/homegym. I think posting this question on that subreddit would get you a ton of the information you’re looking for. I’m not very good at the Internet so just to be clear, r/homegym is a forum on reddit.com. Hello, I was wondering if having 5/8 attachments for a 1 inch hole power rack would be a problem? I would want the titan fitness t3 weight holders for my 2×3 power rack, but wondering if I should worry about that. I’m visualizing how those particular weight holders would fit into larger holes, and I think it would cause the weight holder to hang off the rack a little, pointing the peg down a little instead of straight out at 90 degrees, and that wouldn’t be good. I could be wrong, but that’s how I’m visualizing it. Some other attachments like J-hooks can work fine in larger holes, because the barbell puts the torque force front to back, and the bracket covers the front and back side to prevent front to back movement. The weight holders sticking out a side aren’t supported by the brackets in the right direction to prevent wobble when the holes are too big. Kind of hard to explain, but I hope that makes sense.